When my buddy, Biya, asked me to act in his film, how could I say no? 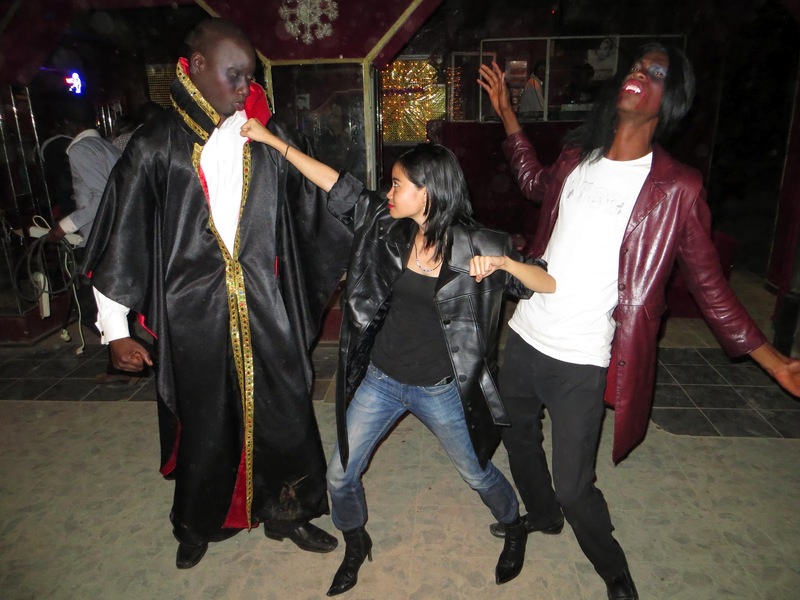 In my eyes, there would be no better way to wrap up my Peace Corps experience than to star as the heroine in a vampire movie! This was also not just any movie. This was a grand production of the "Who's Who?" of Ngaoundere's artistic outlets. The movie premise? As I put on makeup in the bathroom of a nightclub, I see the vampires approach the dance floor. I run out to save the nightclub goers and stake the vampires. Unfortunately, I myself die in the process. It's a goodie! Unfortunately, the timeline of the film is on "African time," so I really will never know when it gets finished. Until then, all I have are these behind-the-scenes photos and videos until the world premiere of "Easy Blood." Peace Corps Project: The Grand Opening of the Mbideng Market! The past months included many tasks including building a coalition of leaders, holding multiple community meetings, negotiating with landlords and government officials, drafting contracts, performing word-of-mouth and radio publicity, and finding creative solutions amongst limited (i.e. zero) resources. Welcome to the Mbideng Market! *By July 4, 2012, 136 vendors had come to sell their goods from all over the city. The mayor aided in publicity by securing announcements with public and private radio stations. Ninety percent of vendors surveyed stated that they have seen their daily incomes increase. One hundred percent of clients surveyed stated that they save time, money, or both by buying from the community market as opposed to going into town. The best travel experiences occur when one breaks out of “tourist trap” attractions and into the local scene: where locals eat, how locals live, etc. It’s then when one can really experience another culture and therefore begin personal growth and mutual understanding. What if, though, beyond traveling like a local, you actually became one? Not just going through the motions for a few days, but living abroad for an extended time? Now, to take it further, what if you forwent a traditional American salary for two years to live in a developing country all the while providing your talents to a greater cause? Welcome to life in the Peace Corps! The Peace Corps is an independent government agency that places volunteers in developing countries in various sectors across business, education, health, environment, and community development. Volunteers serve for 27 months (two years of service after three months of technical, cultural, and language training) living at a level next to those they are serving. Simply put, not only are you aiding in grassroots development, but it’s your job to foster cultural exchange too. Peace Corps Volunteers serve all over the world from Latin America to Eastern Europe to Southeast Asia. I live in Cameroon working as a Business Advisor for the Community Economic Development program. Contrary to popular belief, no, I don’t live in a small African village without electricity (though my best friend does! ), but rather a second-story apartment in a city of 400,000 people, mostly Muslim and Christian. In Cameroon, we have everything from Science teachers in schools to Community Health Volunteers in hospitals providing HIV/AIDS outreach. I’m a Business Volunteer, so I consult a microfinance institution and organize illiterate men and women into micro-credit cooperatives to provide a means of savings and lending for business-related activities. I also work with A2Empowerment to help girls who have dropped out of school return to school. Each Volunteer’s community is different, so it’s impossible to predict the work you’ll do, but you can create the experience you want. The Cameroonian government provides private housing and Peace Corps provides a stipend that is more than enough to cover food, travel, communication, health, and miscellaneous expenses. I find it more than sufficient to cover all my needs; some Volunteers end up saving a couple thousand dollars through the experience while others dip into American money that they’ve saved – it’s all about money habits! It may be Sub-Saharan Africa, but the world is a globalized one. Being in a large city, I can Skype my friends and family (well, if internet is working) and even the Volunteers who live “in the bush (i.e. WAY out there! )” have cell phones. We’re provided a bicycle, but I much prefer to ride motorbikes all over the city or to a local waterfall that’s 15km away (my friend in Panama received her own canoe!). I came to Cameroon with a bare understanding of French and now I find myself thinking and leading meetings in French! There is a high degree of illiteracy in my city, but since I’ve been here so long, I’ve been able to pick up the African language of Fulfulde. Do you know how much Cameroonians love it when you speak their native tongue? A lot. It’s the moments that I could have never predicted that I love the most. For one of my birthdays, I ended up riding on the back of a motorbike for six hours in the rain. We stayed at a notable’s house and climbed caves the next day that were 30 meters below ground. The rest of the afternoon was spent war dancing with the Nyem Nyem people. Forty-eight hours earlier, I had no clue this would even happen. Knowing fair prices at the market, playing on the local soccer team, developing close relationships – this is life! I may be sporting clothes from African fabric, but Americans stick out worst than pimples on prom night. Some days I enjoy the celebrity status, and other days, it’s like a self-conscious fishbowl! No matter what I do is weird, so I just tell everyone else how weird they are too. I’ve also definitely picked up my fair share of foreign diseases, but hey, now I have good stories right?